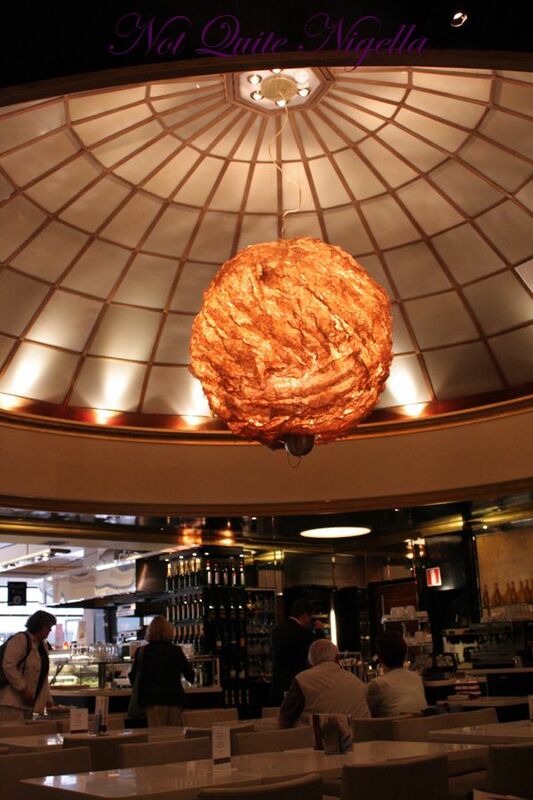 Fazer café is the Finnish equivalent of an afternoon tea salon. Started by Karl Fazer (pronounced "Fahtzer") in 1891, it is said to be the place where "the female population of the city would spend time, taking certain pleasure in using up the last pennies of their fathers, brothers, fiancees and admirers for indulging in huge amounts of sweet delicacies" and indeed looking around there are ladies lunching on salads, sandwiches or divine little cakes and chocolates. 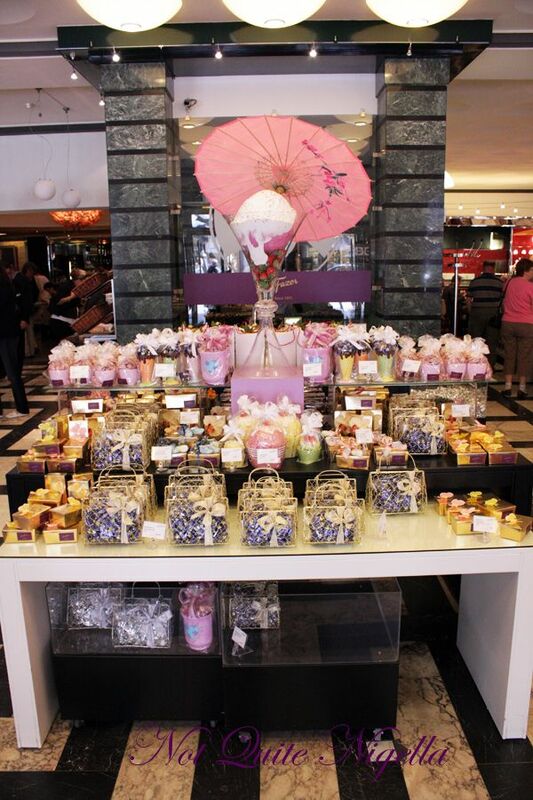 Beautifully merchandised, the windows beckon with tantalising colours and delicate morsels. When we had walked past on the Sunday when they were closed, I practically drooled in front of the window so the next day a plan was made to come here. And if anyone should derail these plans, they will incur my wrath! 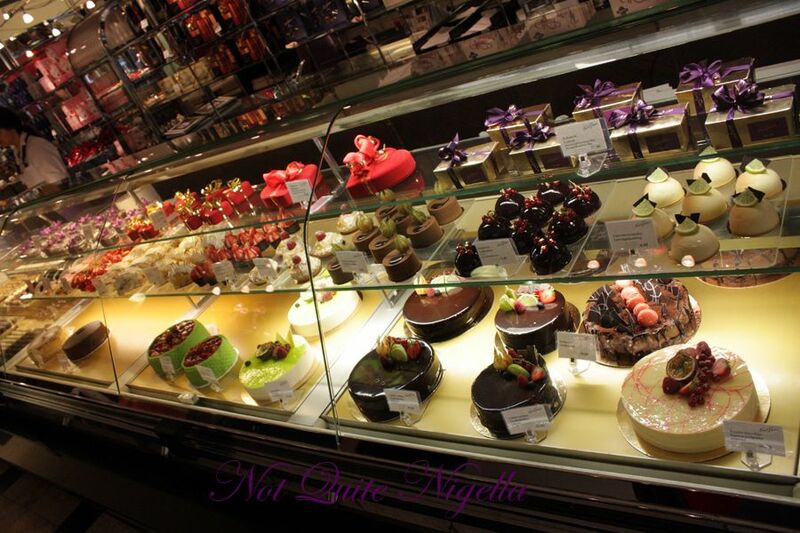 The shop is broken down into two areas, on the left are the cakes and savouries and on the right are the chocolates and jellies. There is an area towards the rear of each in which to eat. It reminds my sister of the Wolseley although curiously they have self service which is apparently quite a Scandinavian thing. You take a tray, select your food from behind the glass cabinet and they pass the food to you and you then pay at the front, much like the nicest cafeteria you'll ever come across. My sister and I select some open face sandwiches to share and my husband chooses to partake in the lunch soup buffet 8 for a choice of three soups: a vegetable one, a meat soup and a seafood soup with bread and butter. 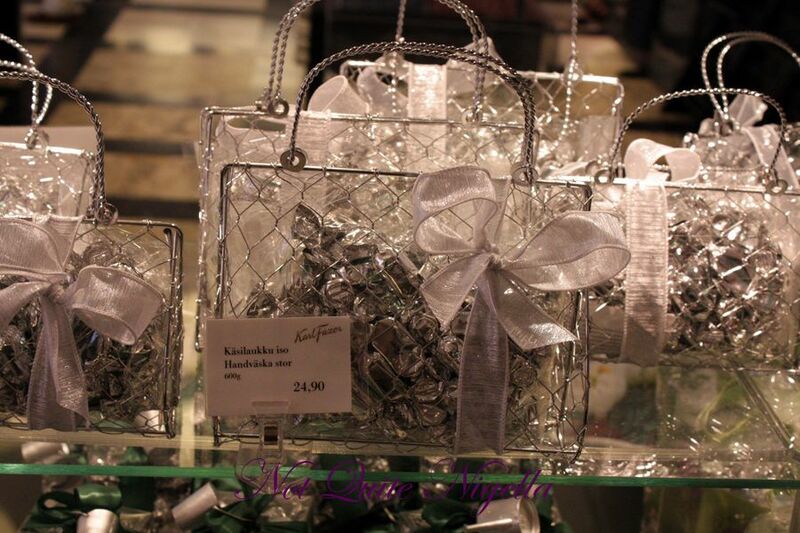 There are also a selection of salads and of course the gorgeous cakes to choose from. 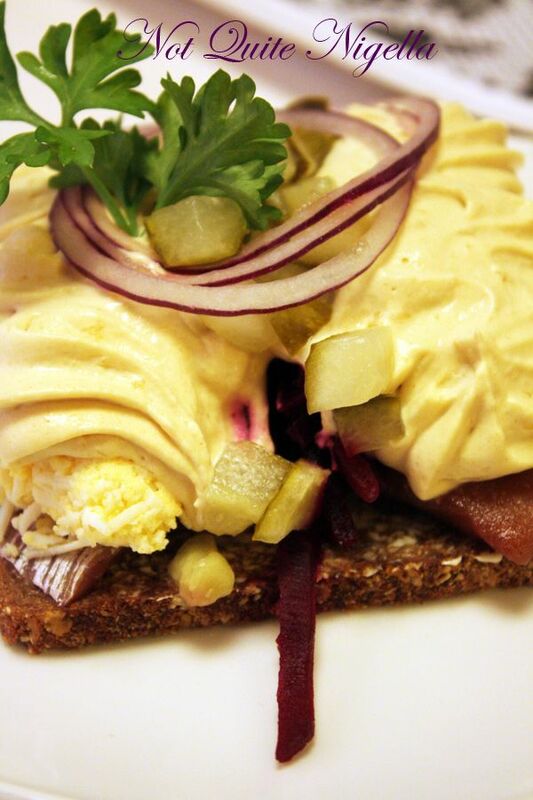 We choose a Russian open faced sandwich with fish paste and eggs 8.20 (Voileipa Sill ala Russia), a chicken sandwich 7.30 (Resissumies Kana) and a prawn and egg sandwich 7.70 (Voileipa Katkarapu). The Voileipa Sill ala Russia is fairly bland and needs a little salt and pepper. 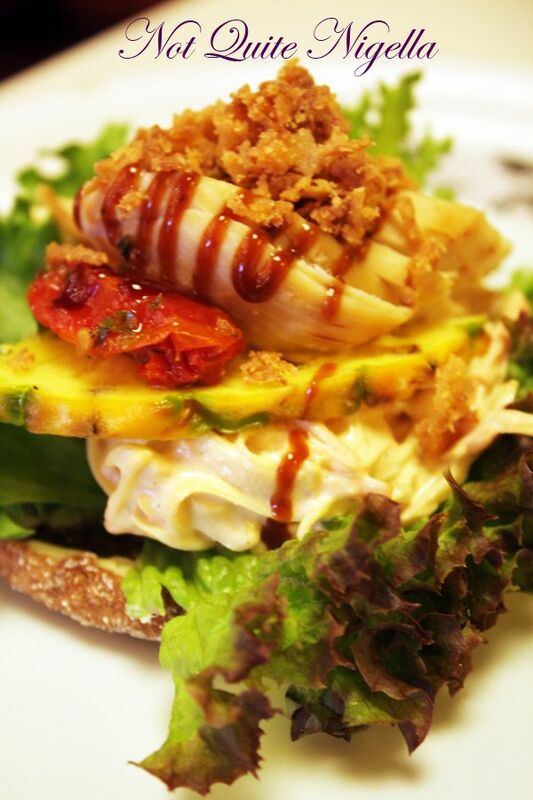 It's certainly creamy and piled high with toppings though and tastes mostly of eggs. The Resissumies Kana E7.30 is delicious, the chicken moist and sweet and the topping perfectly balanced. It's my favourite of the lot although it sounded less exotic. 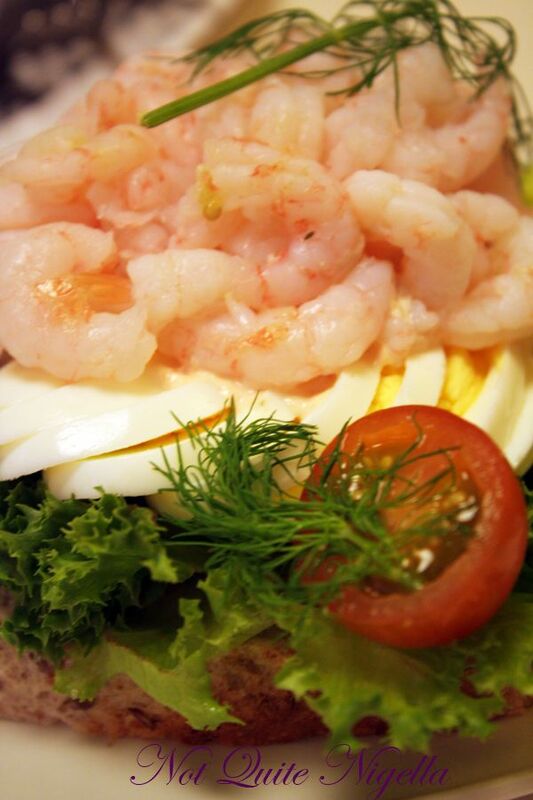 The Voileipa Katkarapu is packed with small fresh prawns which sit on top of a cloud of thousand island dressing. It's piled high with prawns and great value. 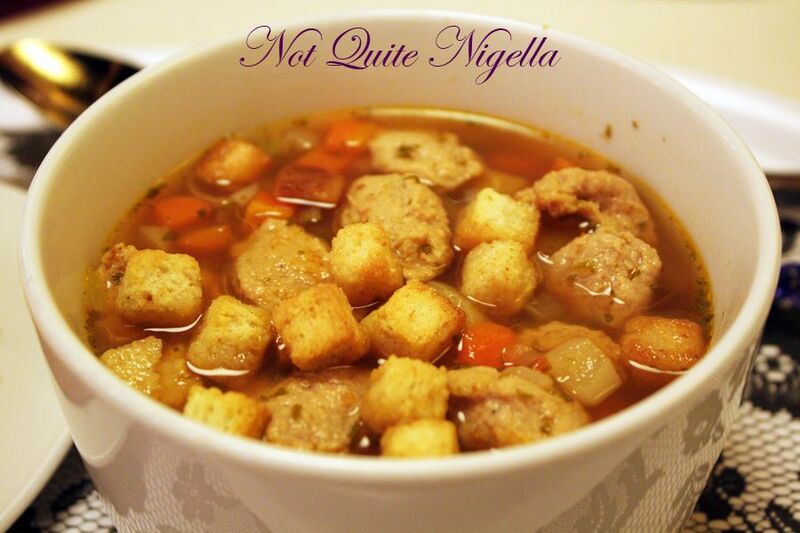 I try some of my husband's soups, the vegetable one is a creamy potato and leek soup, the meat one is particularly good with halved meatballs amongst vegetables whilst the seafood is a little disappointing, tasting mostly of celery and carrot with some tiny prawns scattered throughout it. Savouries savoured, we move onto the sweets. 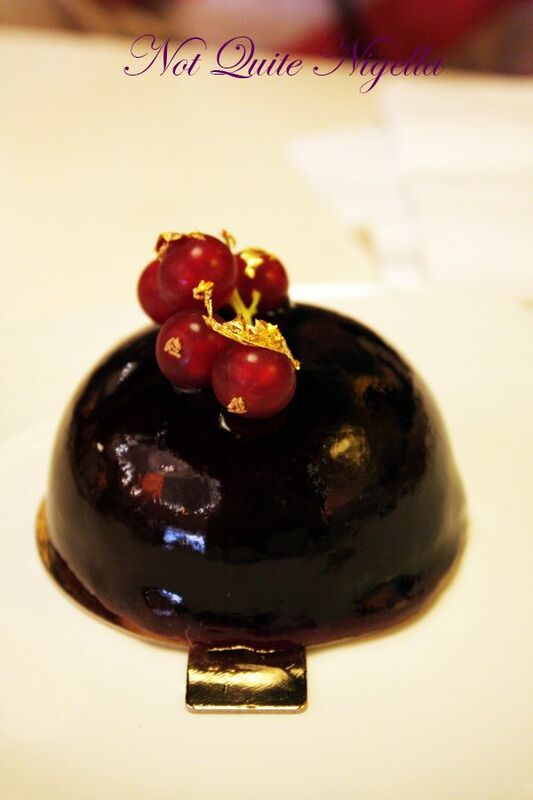 I choose the perfect dome of berries with the delicate sprig of gold leaf redcurrants on top. I also select a slice of traditional Finnish caramel cake and a section of apple slice and a sweet roll to takeaway for our drive to the countryside. 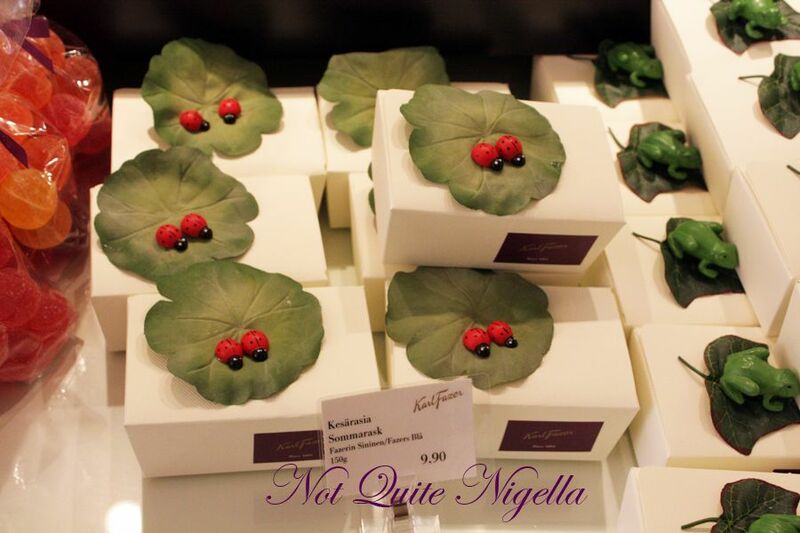 The Berry cake is divine, filled with white chocolate with a sweet berry jam centre it is the perfect level of sweetness. The fine covering of sweet jellied berry is divine against the rich white chocolate centre. 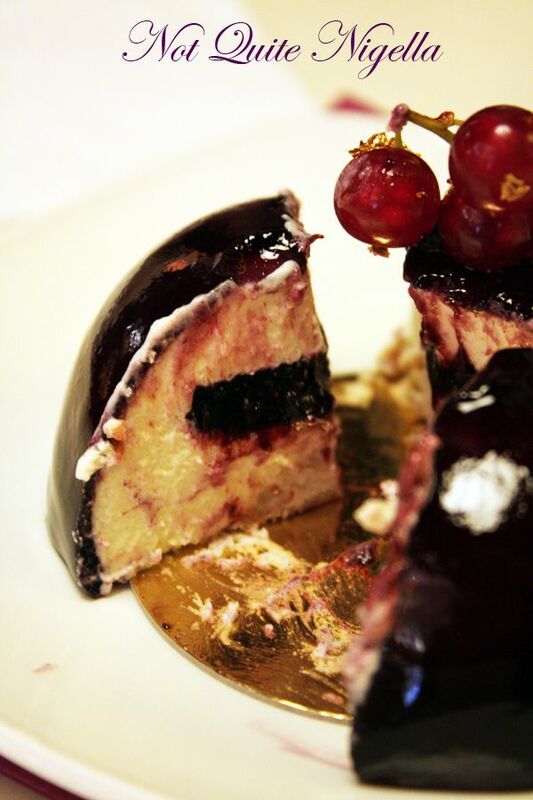 It is topped with redcurrants flecked with gold leaf. Simple perfection. 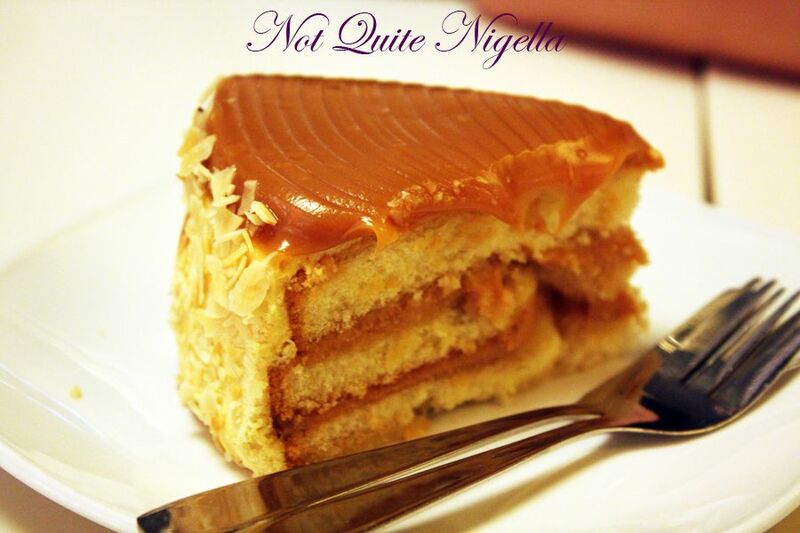 The Finnish caramel cake is coated in a thick icing of caramel, the centre sponge slices filled with caramel too. 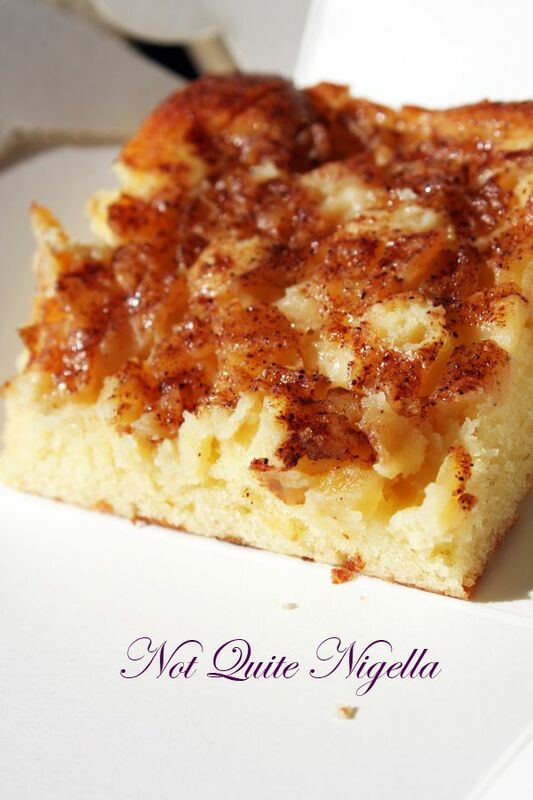 The sponge itself is a bit dry and tastes a little stale but the caramel helps somewhat. Later we try the apple slice, it's fairly light on apples but tastes richly of custard powder. 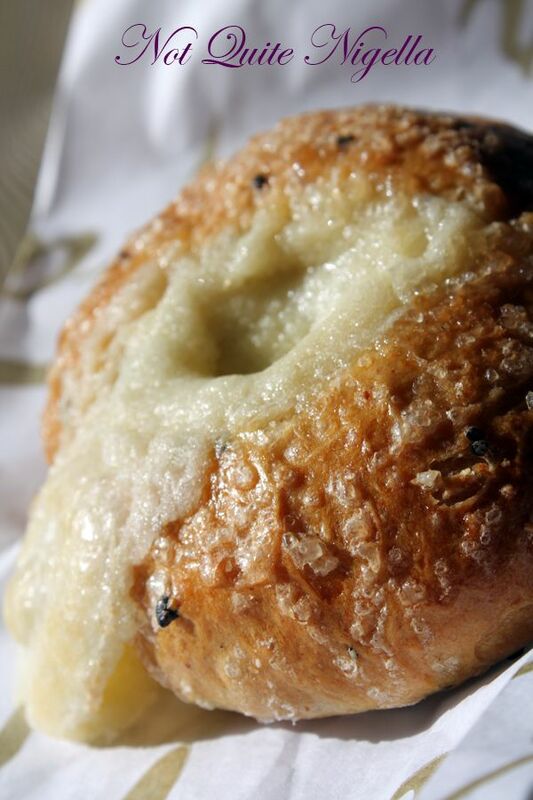 The sweet roll is topped with a sweet cheese and sugar and then baked to produce a crispy sugar crust. It is also strongly flavoured with cardamom which gives it an interesting touch. featureMy Little Secret: The Not Quite Nigella Book, Published by Penguin Books!!! feature My Little Secret: The Not Quite Nigella Book, Published by Penguin Books!! !